With one tweet, President Donald Trump announced Tuesday that Rex Tillerson would no longer lead the State Department. Tillerson, the former CEO of ExxonMobil, served just more than 13 months as secretary of state. His tenure was one of the shortest in the agency’s history, as detailed by The Washington Post here. During Tillerson’s time in office, 60 percent of the State Departments’ top-ranking career diplomats left the agency, and new applications to join the foreign service fell by half, according to data from the American Foreign Service Association. Tillerson also leaves office as the U.S. prepares for historic talks between Trump and North Korean leader Kim Jong Un, an effort Tillerson said in departing remarks that he had helped lead. We asked experts what they thought about Tillerson and his tenure, the State Department he leaves behind and the challenges that face CIA Director Mike Pompeo, who Trump nominated to fill the position. Tillerson and Trump couldn’t see eye-to-eye on a number of issues, including the Iran Nuclear Deal. The PBS NewsHour’s Daniel Bush outlines some of those disagreements here. 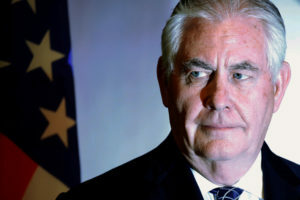 Tillerson never quite made the transition from corporate CEO to government leader, and “undermined himself by making several grievous managerial mistakes,” Stewart Patrick, a senior fellow and director of the International Institutions and Global Governance Program at the Council on Foreign Relations, wrote in an email to the PBS NewsHour. Who wins and who loses with Tillerson out? Internationally, “the big winners are Japan, Israel, the UAE, and Saudi [Arabia]. The big losers are North Korea, Iran, China and Qatar,” said Kenneth Weinstein, president and CEO of the Hudson Institute. Mike Pompeo, director of the CIA and former Kansas congressman, could have “one advantage Tillerson lacked: the president’s ear,” Patrick said.“Director Pompeo is intelligent and strategic, asks the right questions, and doesn’t have his own agenda as Secretary Tillerson did,” Weinstein said. “But the biggest question is whether Pompeo, whose loyalty has endeared him to the president, will stand up to Trump,” Patrick said, “when the latter threatens to create diplomatic chaos or recklessly ignores threats to the United States.” “Mike Pompeo inherits a State Department that has been marginalized in the conduct of U.S. foreign policy and where staff morale is at rock bottom,” he added. The PBS NewsHour’s Larisa Epatko and Layla Quran contributed reporting to this story.